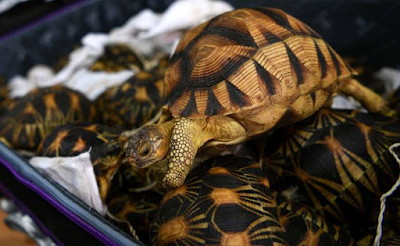 Officers of the Malaysian customs Service in Kuala Lumpur foiled an attempt to smuggle hundreds of the world's most endangered tortoises into the country from Madagascar, a senior official said Monday. Speaking to AFP, the deputy director of the customs department, Abdul Wahid Sulong, said the 330 ploughshare and radiated tortoises worth around $276,784, were seized at Kuala Lumpur International Airport on Sunday. 'All of the reptiles were found alive. It is a big haul. It could be for the local market or for re-export. We are investigating,' the enforcement agency said in a statement. 'Based on a public tip-off, customs officials raided the cargo area of the airport and found five suspicious crates. It had arrived at KLIA on an Etihad Airways flight from Antananarivo airport in Madagascar,' the statement added. According to Abdul Wahid, the contents of the crates were labeled as stones and the address of the recipient was found to be false. Importing of critically endangered animals in Malaysia is not prohibited as anyone found guilty of the offence can be jailed for up to three years and fined. However, the golden-domed ploughshare tortoise is native to Madagascar and is the most endangered tortoise on the planet while Madagascar's radiated tortoise is considered one of the most beautiful species of the animal.